This photograph has recently been the subject of correspondence in the weekly email newsletter. The question is: where is it? The engine is Problem No. 610 'Princess Royal' on three W. H. Smith's vans used for sorting newspapers. On the back of the photograph the location is recorded as Carlisle but this is believed to be incorrect as the signal box is not at Carlisle. The date must be sometime in the early 1890s, as the loco has a front vac pipe and no coal rails on the tender; coal rails were introduced in May 1895 and fitted quickly on most express passenger engines but took longer to fit to tenders of goods engines, some not having them in 1900. The engine is also of interest in having an 1800-gallon tender rather than the 1500 gallon version more common on the class in this condition. I can confirm that the signal box is not at Carlisle and also not at Stechford, neither place having this type of box. Any other suggestions? The cabin is a fairly large one, Type N to suit 70 levers. Both Stechford cabins were smaller than this. There were only a few of these between London and Birmingham. In fact only Grand Junction, Leighton Buzzard No.2 and Willesden No.4 were of this type. I favour the latter - if so the photo was taken from the end of the up fast platform and the train is standing in No.2 siding. The only flaw in this is that No. 2 siding was down, not up, and this suggestion supposes that the loco is at the South end of the train. Surely the only train which would have had so many newspaper vans would be the 3.00 Euston/Birmingham/Liverpool/Carlisle, which was divided at Rugby, with the front portion going to Birmingham, detaching a van at Coventry. The problem with the theory that this must therefore be the Birmingham portion is that it arrived at Birmingham soon after 5am which would imply Summer and a very early-rising photographer. The second, Liverpool/Carlisle, portion normally comprised only two vans, with the Carlisle van detached at Acton Bridge. An alternative theory is that this might be the Liverpool (or Liverpool/Carlisle) portion with an extra van or two. As this portion arrived at Liverpool at a more social hour it is more likely to have been photographed. The Birmingham/Coventry vans worked back to Euston under local arrangements. So if this could be shown to be an up train it might be the return working. Newspaper vans also ran from Liverpool to North Wales and from Manchester Exchange to the north. But it seems unlikely that three vans would be unlikely in either case and they would hardly ever be seen in daylight. I don't think the signal box can be Willesden No 4 because the Ordnance Survey 1:1056 plan surveyed in 1891 shows this cabin to be only a little over 38ft in length - so (assuming it was a standard cabin) it would have been size M at that date. Also, the steps are shown at the west end, so if the photo had been taken from the south side, the background would have been filled with a plate-girder overbridge. Of course, changes might have been made between 1891 and the date of the photograph. Identification should be easy - a size N box, whose brick chimney suggests an early one, the loading gauge which suggests a goods yard or sidings close by, the angle of the sun which reduces the possibilities - but so far I'm stuck. 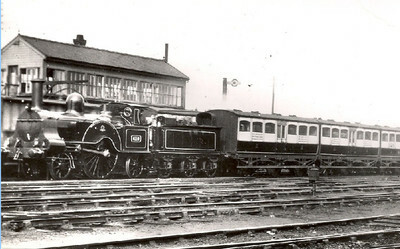 The only other photo I can find showing engine No 610 in similar condition, but with a smaller tender, was taken c1890 at Manchester London Road. Which isn't much help! The photo of the W. H. Smith's vans has been identified conclusively as being at Crewe. Not by me, I hasten to add but by David Patrick, based on the top photograph on page 65 in Railway Archive No 7, and confirmed by Richard Foster. Richard says that the GWR engine in the photo (Ed: in the magazine) is standing at the entrance to one of the down-side south end bays and that the photo was taken from the end of the down loop platform. Richard goes on to say: Quite right, all the (rather limited) evidence in the Smiths Vans Photo fits the south end of Crewe. Not sure what the caption to the GW loco photo says, but that picture was taken from the end of the down loop platform, with the loco standing at the entrance to one of the down side south end bays. The location is the south end of Crewe station. The signal box is Crewe Station South, built 1878, with 72 levers and therefore the right size lever frame for a Size �N� box as the one in the photograph is. (Note Crewe Station South is a different signal box to Crewe South Junction). What the Photograph Shows (Based on a track plan of the then new layout at Crewe South in 1880). The photographer is standing in the Up Side Carriage (Wall) sidings, a little south of the end of the up platforms, with his back to the retaining wall. (the left hand of the 2 sidings with vehicles in to the left of the box in the GW 0-6-0 photo). The locomotive and vans are standing in one of the two down side carriage sidings (vehicles can just be seen behind the locomotive in the other one). The siding is being used for just what it was intended. The sidings connect into the south end of the main down platform and were used for attaching and detaching vehicles to/from north-bound trains. The vehicles were kept in the sidings so that they could be quickly attached to a train or moved into the siding out of the way until ready for their next movement. It can therefore be deduced that the vans have recently been detached from a north-bound train and moved into the siding to clear the platform and await their next move. Similar sidings were provided at many large LNW stations for this purpose. The area was extensively remodelled and the station enlarged c1900 and the signal box was replaced by the new Crewe South junction signal box.